Woodrow Wilson came to the University of Virginia in the fall of 1879 to study law, though he was purportedly more interested in American and English political history than in his formal law courses. Poor health forced him to withdraw and return home a little more than a year later. 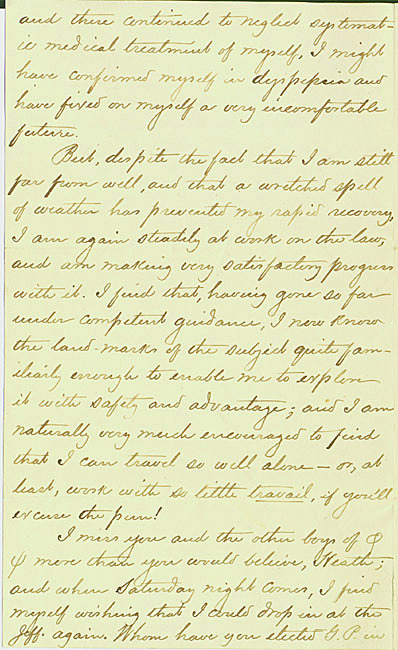 In this letter, Wilson reports on his health, mentions his current activities including law studies and his new role of "vocal star," inquires after activities at the Jefferson Society, sends regards to his friends including future Virginia English professor Charles "Chucky" Kent, and asks who has succeeded to his room [at 31 West Range]. The letter's recipient, Richard Heath Dabney, was a lifelong friend of Wilson's and a faculty member at the University for 49 years.